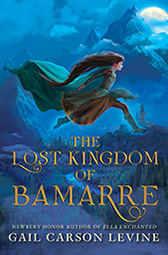 Lost Kingdom is the prequel to The Two Princesses of Bamarre, my first real prequel. Yes, Fairest takes place a few years before Ella Enchanted, but the two stories aren’t connected. I wanted to try my hand at setting up conditions for the earlier book, which begins with a “rag tag band” entering Bamarre. Who were they? And how and why had their former home fallen into ruins? Of course I turned to fairy tales, and “Rapunzel” popped up. Hmm... an abduction. Hmm... magical hair. And there’s already magic in the world of Two Princesses. I couldn’t use it all, because the monsters are stuck on the other side of the Eskern mountain range, but fairies don’t recognize borders, and neither do magical objects. Then I added a few new enchanted elements, which I won’t mention. However, I ran into trouble planning my plot, because, in my opinion, the fairy tale “Rapunzel” goes limp after the prince plummets from the tower. What popped up to fix that was part of the bible story of Moses. See if you recognize it.